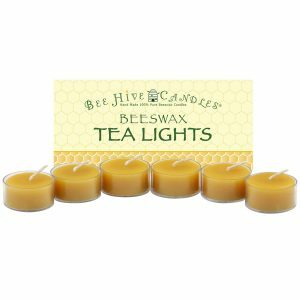 Our tea light beeswax candles may be small in size, but like all our beeswax candles, they still give off a bright cheery light and delicate honey scent. Each hypo-allergenic beeswax candle is hand crafted using a lead-free 100% cotton wick and lightly filtered 100% pure beeswax from the USA. 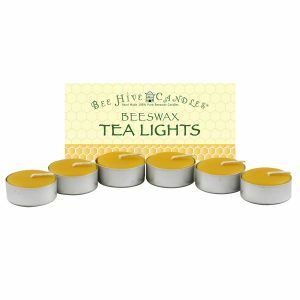 Our aluminum cup tea light beeswax candles make perfect additions to many of the small places around your home: bathrooms and kitchen to name a few. After the tea light is fully used, the aluminum cups are recyclable. We use only clean, lightly filtered, 100% pure beeswax from beeswax cappings in our beeswax candles, with no fillers or additives. Its non-toxic properties make it perfect for a clean burning and bright fuel source as a beeswax candle. All of our beeswax is made in the USA. Unlike paraffin candles, beeswax is hypo-allergenic, great for people with allergies or other sensitivities, and those of us who want a clean burning candle in our homes. We craft all of our beeswax candles by hand. It takes an experienced hand to ensure each candle is perfect - we don't want any air bubbles, crooked wicks, or other imperfections. Each candle is inspected to ensure its quality. We have no "factory second" beeswax candles; if the candle doesn't make the grade, it goes right back into the wax melter. Some candle makers will ship you their product directly after removing it from the mold where it is often unleveled, uneven, and simply unattractive. We've always taken the time to carefully hand finish each candle so that our beeswax candles are as stunning to look at as they are beautiful to burn. 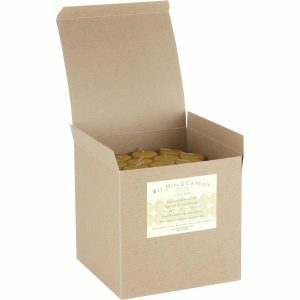 Our beeswax candles naturally give off a luscious honey aroma. Scent varies slightly based on honey, pollen, and propolis present in the beeswax. A candle's scent throw (i.e. the candle's ability to deliver an aroma) varies based on personal sensitivities and environment. The raw beeswax we use comes from the hive as a light golden yellow color, which we call "Natural" when we refer to the candle's color. The natural color of beeswax is determined by the remaining pollen and propolis in the wax; this color varies a little between each batch. 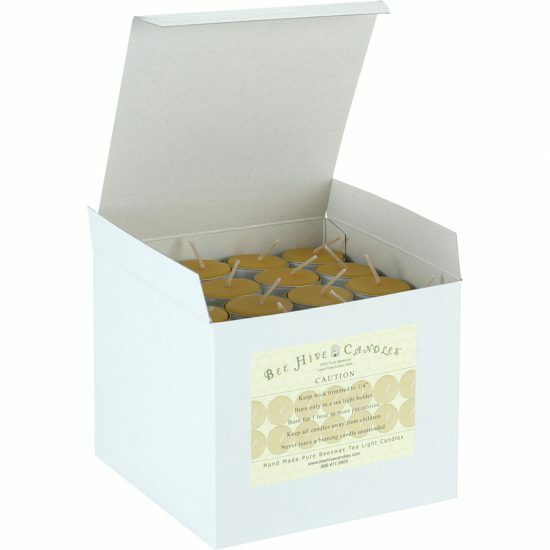 Our naturally golden colored beeswax candles do not contain dyes. Bloom is a white film that naturally appears on beeswax over time. Our colorful beeswax candles can be kept polished for a shiny modern look or let their age show by allowing the bloom to appear over time. The bright color of beeswax is a great backdrop for showcasing the white antique finish of the bloom. Using clean burning beeswax candles is an excellent way to keep your home free of the smoke and soot that is a common result of burning paraffin candles. When burned in a draft free environment with the wick trimmed to 1/4" a beeswax candle will burn bright and clean with virtually no smoke or soot. Negative ions are most commonly found near moving water, such as crashing waves, thunderstorms, and waterfalls. Negative ions are believed to produce biochemical reactions that increase levels of the mood chemical serotonin, helping to alleviate depression, relieve stress, and boost our daytime energy. While it is still debated and not yet scientifically proven, it is believed that there are other natural negative ion generators too, including our specialty, beeswax candles. A beeswax candle is less likely to drip than other types of candles because of the complex molecular structure and higher melting point of beeswax. This allows the wick to burn the molten beeswax at just the right pace so it doesn't drip out of the wax pool. These qualities combined with a properly maintained wick, a level burning surface, and draft free environment will help prevent drips from occurring. Beeswax candles are naturally drip resistant. Paraffin candles require chemical additives, like stearic acid, to make them drip less. We hand pour each of our beeswax tea light candles. The dimensions listed are an approximation and will vary slightly for each candle. Please consider each candle a work of art. We make outstanding candles, but we are humans, not machines. Learn more about why candle size varies. Burn time is a close approximation and will vary somewhat based on your environment and burning preferences. Our listed burning times are conservative averages, not a guarantee. Proper wick maintenance helps (keep wick trimmed, avoid drafts). Some wax will remain unused after the wick has been fully burned, this is normal. Never leave a burning candle unattended. Keep candles away from children. Burn candles in a draft-free environment. Keep the wick trimmed to 1/4". See Beeswax Candle Safety for more safety tips. Burn tea lights for at least 1 hour per session. For maximum burn time, burn tea light in one session. Tea lights should be burned in a tea light holder. See Beeswax Tea Light Burning Tips for more tips. I compared a lot of different beeswax tea lights before buying the 112 from here. This bulk option really is one of the best options I could find. Each cup nearly overflows with wax. This isn’t a problem during burn, but is just a nice details that shows Beehive doesn’t scrimp on product despite the good price. The burn time is excellent. As to the re-lighting problem I see some other reviewers commented on, I only have a problem if I haven’t trimmed the wick. If the wick is trimmed to 1/4 to 1/3 in, it lights up and burns easily until every last drop of wax is gone. More a comparison of beeswax to paraffin counterparts: these candles have a strong glow and intense array of reddish colors in the light. Quite a different experience from paraffin candles that have a very flat light. Any shadows have clear light and dark lines. You’d think these beeswax candles have curved beams for how they seep past the shadow borders with an intense glow. Your candles are the best! Once in a while, I run out of your candles and purchase some others to tide me over. The others always disappoint. Your candles are the best! These candles are the best. They burn until all the wax is consumed. I would highly recommend them to anyone. This is probably the fourth or fifth time I’ve reordered the tea lights in the aluminum cups. They burn well, they smell great and I love the fact the they are packaged in a basic cardboard box and there is minimal packaging. In 2019, we have resolved to go as close to zero waste/zero plastic as possible. Knowing that the product and packaging aren’t contributing to global warming, pollution or more landfill / ocean waste is important to us. We also like purchasing products made in the U.S., Canada or Mexico made with locally sourced ingredients. Basically, these are an all-around win/win! These beeswax tealights are extremely high quality. I ordered a case of the tealights this time and am very happy. They burn nicely and have a wonderful scent. I trust this store to give me the highest quality beeswax candles and have never been disappointed. I like the free 6 pack of votives also. Best quality candles I've found! I placed my first order over a year ago when I began making the switch to non-toxic household products. A friend recommended I try beeswax candles, and after much searching on the web, I came across Bee Hive Candles. I just received my 3rd order, and I’m still a super happy customer. Shipments arrive quickly, are packaged well with no damage, and I ADORE the metal cup tea-lights for everything….essential oil warmers and in holders for ambience. And you cannot beat the price and quality! I love burning candles, but most candles give me headaches due to the chemicals in the wax. I decided to try beeswax candles since they’re natural and free of chemicals. I’m happy to report that these candles didn’t give me a headache! From now on I’ll only use beeswax candles. On a side note, I was pleasantly surprised that this company is located in Northern Washington. I also live in Washington so the shipping was super quick. Glad to be supporting a local business. These tea lights last such a long time and are completely gone when they are done. No mess. The tea lights are just as expected. I’ve used this product before but never bought in quantity. Easy ordering and they arrived very soon after we placed the order. I’ve compared prices, and these are by far the best value. Made with great care by a wonderful small business, which makes me feel even better about my purchase. Lovely scent (subtle) and good for the environment. mentioned, difficult to relight, but not a problem in my household. Sometimes there remains a small amount of wax – never certain if I can send to recycle with residual wax (??). Much prefer aluminum to plastic, however. Hello and thank you for your feedback! Yes, you can still recycle the aluminum cups if a little bit of beeswax remains. Tip: Ideally when the tea light has about 50% or less wax remaining, let the tea light burn out on it’s own. It’ll use up all or just about all of the beeswax that way. Exactly what I ordered. In perfect condition upon arrival. For cheap. These candles do burn for longer amounts of time than their synthetic equivalents but after they have been put out (before they are totally finished), then they are darn near impossible to relight. Thanks for your input Vicki! Yes, after a tea light reaches the half way mark it is difficult to relight them as there is very little wax and wick remaining. We recommend burning them in one or two sessions. When the tea light reaches the half way point, let it continue to burn until the wax is fully used. Very clean an long burning.love the natural smell. Copyright © 2019 Bee Hive Candles, Inc. All Rights Reserved.